Last week, I was visiting a friend and noticed a large collage on a poster above her desk. She was excited to tell me about her "vision board" which contained images and words she had clipped from magazines. She told me she uses the board as a daily reminder and inspiration to pursue her dreams. I thought it was great idea and immediately began thinking of what I would choose for my own vision board. Today, while I was thinking about what to post on the blog, I was poking around in a pile of papers on my desk. I came across a hastily jotted note to set up another Girl's Day Event with my writer friends. We try to get together once a month to get out from behind the computer and pretend we have a life. So far, we've had a painting day, a park picnic, lunch and art walk in Laguna Beach, Chinatown excursion, Garment District shopping day, and pilates day. I thought a Vision Board Day would be fun. So, I Googled "vision board" to give me some ideas on how to set it up. That's when I came across a great blog (http://www.christinekane.com/blog) and found an article I wanted to share with our Muffin readers. After you finish reading this article, be sure to stop by her blog. She has tons of great articles about finding ways to be creative. - A big stack of different magazines. (You can get them at libraries, hair salons, dentist offices, the YMCA.) Make sure you find lots of different types. If you limit your options, you’ll lose interest after a while. When I facilitate my women’s retreats, I always make sure we have plenty of Oprah, Real Simple, Natural Home, Yoga Journal, Dwell, Ode, Parenting, Money, Utne, and an assortment of nature magazines. - Glue. Not Elmers. (It makes the pages ripple.) I like using Yes! Glue or Rubber cement. Glue sticks are my second choice because they don’t last. No matter which method you’re choosing, have a little ritual before you begin your vision board. Sit quietly and set the intent. With lots of kindness and openness, ask yourself what it is you want. Maybe one word will be the answer. Maybe images will come into your head. Just take a moment to be with that. This process makes it a deeper experience. It gives a chance for your ego to step aside just a little, so that you can more clearly create your vision. Put on soft music. My favorite music for activities like this is Anugama Shamanic Dream I and Shamanic Dream II . I love these CD’s for massage or any activity where you want to keep your mind quiet. - You’re very clear about your desires. - You want to change your environment or surroundings. - You have a vision of what you want, but are uncertain about it in some way. - You know you want change but don’t know how it’s possible. - It’s your birthday or New Years Eve or some significant event that starts a new cycle. - If you are working with one particular area of your life. For instance, Work & Career. 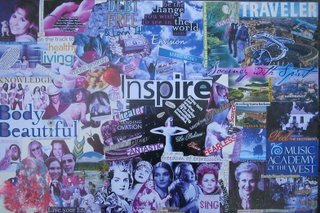 - You can use a combination of all three types of vision boards as you create. Sometimes you might start out doing one kind, and then your intuition takes over and shifts into a whole different mode. That’s called creativity. Just roll with it. - Your vision board might change as you are making it. I was just talking with a friend of mine who said that she had been making a vision board for the new year. The theme was all about what she wanted in this year. Then, as she pulled pictures and began to lay them out, the theme changed into a simpler one about her everyday life and the moments in each day. It surprised and delighted her to experience that evolution. You might find that you have little epiphanies from making a vision board. Great idea! I used to do something similar when I was still in the classroom. Students would create a collage showing their goals for the year. I'd post them around the classroom for awhile, and eventually, they were placed in their writing portfolios. If they were stuck finding a writing topic, they were to turn to the collage and draw from it. Also used it as a measurement tool to see what their goals were/have they achieved their goals. I hadn't thought about using it for writing, but what a great idea. I love making vision boards/collages. Often I do smaller ones--it doesn't always have to be a giant production! Good things seem to come of it, whenever I do it. It's always nice to try a new way to organize ideas. I like the visuals, giving writing thoughts a new twist, inspiring in different ways. I have a picture of my vision board as my cell phone wallpaper to see it more often. 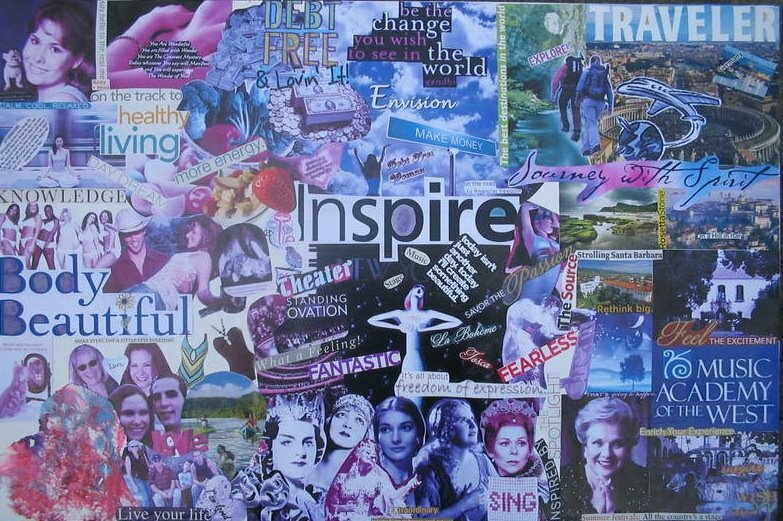 Vision boards are great sources of encouragment and inspiration. Thanks for sharing. If you get the chance, feel free to hit me back on my site. To whom it may concern regarding this great article I have one question regarding vision boards…. I’ve tried these boards religiously with NO LUCK and nothing for almost a year and I worked my fingers off to the bone & have done everything humanly possibly to find FT job and still 1 year no job…can anyone explain that to me please??? is the universe telling me I am NOT deserving of FT job??? can anyone help answer my questions here, many thanks. Thanks for this detailed vision board post. It looks like a very simple thing to do and it is, but the hard part for most of us is that we have to look at it and 100% believe that we can achieve our dreams and goals, so if one wants to manifest a job: you see yourself, getting the job, being in the job as detailed as possible,see yourself getting a paycheck from your desired employer, see yourself go to work, open the door to your office with your name of it. The key is as many details as possible and if you can put all these images on your vision board it will be very effective.